Legendary birdman John James Audubon would tell you decisively that, no, birds can't smell. In the 1820s, Audubon designed two experiments to prove that turkey vultures followed their eyes, not their noses, to carrion. First, the naturalist left a stuffed deer in a meadow with its legs in the air. Before long, the deer attracted the attention of a vulture, who dropped out of the sky to investigate. Finding nothing but grass inside the fake deer, the vulture took off. The second experiment took place in the sweltering heat of July. Audubon dragged a decaying pig carcass into a ravine and covered the body with brush. The vultures spotted it, but they weren’t interested. That was that, said Audubon. No smell. For more than a century, scientists took him at his word. Then, in the 1960s, an ornithologist at the Los Angeles County Natural History Museum named Kenneth Stager realized why vultures ignored Audubon’s carcass in the woods: it was just too gross. Like any discriminating diner, a turkey vulture prefers a fresh carcass [PDF], no more than four days old. Through rather odd means, Stager learned that vultures actually do use smell. A gas company worker mentioned to him that turkey vultures would congregate around leaks in the pipeline, showing up so reliably that they began to use the birds as leak detectors. This behavior occurred because the company had added a smelly chemical called ethyl mercaptan to the gas. You know what else gives off ethyl mercaptan? Carrion. Stager was able to tie the two together to suggest that vultures do in fact sniff their way to supper. Stager wasn’t the only scientist interested in bird olfaction. In 1965, physiologist Bernice Wenzel of UCLA hooked pigeons up to heart monitors and exposed them to strong smells. The pigeons’ heart rates spiked each time a scent wafted their way. Then she attached electrodes to the pigeons’ olfactory bulbs (the smell centers of the brain) and started again. The results were just as dramatic. In the half-century since, scientists have tested more than a hundred bird species, and all of them have had at least some sense of smell. At times, their experiments have swerved into the realm of the bizarre. Sensory ecologist Gabrielle Nevitt once soaked super-absorbent tampons in fish-scented oil and tied the tampons to kites, launching them over the sea. The experiment worked a little too well: after a short while, the swarming seabirds were so intense that Nevitt had to bring the kites down in order to keep them from getting tangled in the strings. Just how much a bird can smell depends on its species. The humble kiwi has one of the strongest senses of smell in the bird family, and it’s the only bird with nostrils at the end of its beak. At night, the kiwis sweep their beak tips along the ground like metal detectors, sniffing out earthworms and grubs. Eurasian rollers, on the other hand, use scent in self-defense. When threatened, roller chicks vomit up an awful-smelling orange liquid. The stink not only deters potential predators, but it also acts as a warning. When the adult birds return to the nest, the scent tells them that a predator has been, and may still be, near. Other birds use scent as an instrument of seduction. Crested auklets produce a tangerine-scented oil, which they dab all over their feathers like perfume. The better a bird smells, the better its chances of mating. The same goes for the pudgy, flightless parrot known as the kakapo, which is said to emit a smell like lavender and honey. The kakapo is extremely endangered—there are only 124 left in the wild—so mating is of dire importance. One researcher even considered creating a synthetic kakapo perfume and applying it to unattractive males in the hopes of boosting their chances. 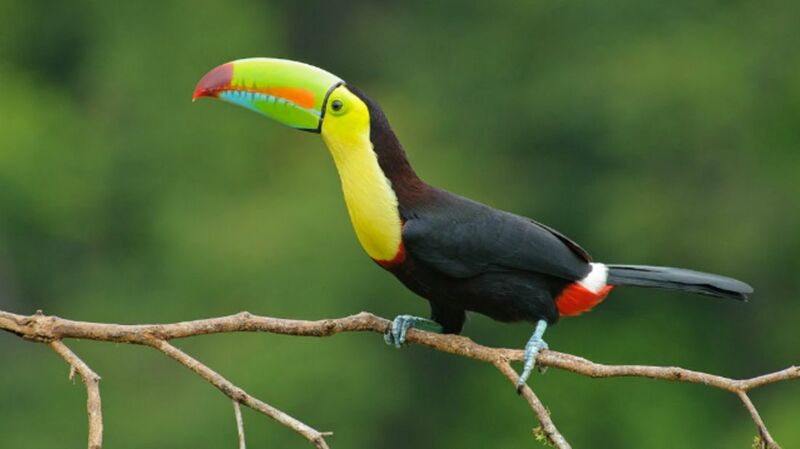 As for Toucan Sam, the jury's still out.